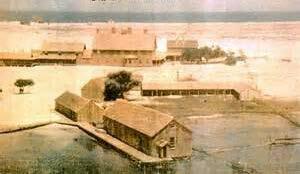 The Currituck Shooting Club was popular among wealthy New Yorkers who would use the sound as their highway to access the Club by boat. Memberships to this Club were very exclusive, and not open to the public; non-members had to be invited by one of the elite members in order to attend. The Currituck Shooting Club played host to many important visitors over the years, including Teddy Roosevelt, J.P. Morgan, W.K. Vanderbilt and Andrew Carnegie. In 1879, a Clubhouse was built for The Currituck Shooting Club situated on what is now Historic Loop and home to several custom, individually-owned residences. The Clubhouse was elaborate, with three sections built from beautiful cedar and lined with ornate hardwood floors. This extraordinary Clubhouse was added to the National Register of Historic Places in 1980. Sadly, in 2003 the Clubhouse burned down. The dock and boathouse that were built alongside the Clubhouse still survive today. At the time of the fire, it was the oldest active Club of its kind. In the 1990's, houses were built on spectacular grounds around a beautifully-designed golf course. Thus began The Currituck Club for what it is today; a premiere resort community beaming with history and one-of-a-kind landscape.